Maicoll Gomez will tell you: He can’t wait to help people not as fortunate as he has been. It’s why he is graduating a year early from William & Mary. “I wanted to make a change in the world as fast as I could,” he said. The latest embodiment of that desire occurred June 27 when Gomez, who will graduate later this summer instead of his scheduled date in 2019, was appointed to the Social Services Board of Williamsburg. He is the first student in that capacity and believed to be the first Latino. “With this position I will be the voice to those who are working 60 hours a week and cannot come to a city council meeting, to those mothers who are working multiple jobs to make ends meet and all those who cannot speak for themselves,” he said. 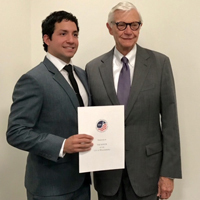 Gomez’s deep desire to help can be traced back to family; in fact, seeking a position on the board was inspired by his older brother, Jonathan, a member of the 2016 Colombia Olympics swim team. In that vein, 18 months ago the children created the Gomez Noriega Family Foundation, designed to help kids who don’t have the support or means to take part in athletic opportunities. The initiative has the support of parents Clara Noriega and Alcides Gomez, it’s been the driving force in Gomez’s life. During his final year of college, he was chosen to be the president's aide, working closely with W&M President Taylor Reveley, as well as a representative to all international students in the International Students Advisory Board while being part of a research team headed by Chancellor Professor of Biology Lizabeth Allison. Gomez chose a path to follow medicine and politics, studying biology and psychology, with becoming a doctor or geneticist in the back of his mind. Among those endorsing him for the Social Services Board post were Mayor Paul Freiling ’83, the Williamsburg City Council and Reveley. The position, Gomez said, will allow him to establish, review and revise local policy decisions, have discretionary power over local funding from both public and private sectors and help provide a variety of welfare services.